There can only be one was the exclamation n Highlander all those years ago. Turns out if you are Spider-Man, that’s not the case there can be loads of you! Miles Morales is the latest entrant to the Spider Cinematic Universe or the SCU as only I am calling it. A young, smart, cool, spray can weaving teenager who has many of the same issues we all did back then(way back for me). Making friends and keeping them, navigating parental concerns and just being seen as cool are hard enough but then to throw in being bitten by a radioactive spider, having to learn what it means to be Spider-Man, the opening of several parallel dimensions, quantum theory, a cavalcade of villains and also the multi verse equivalents of himself thrown into his city desperately needing to get home and things are a little compiicated. Maybe that essay due on Great Expectations can wait! This all sounds overly busy and unnecessarily complicated but this, after all, is a comic book world and these are fairly standard events within those panels. Into the Spider-Verse navigates all the characters, the relationships and humour with ease web-slinging neatly through the smallest of gaps to ensure that all references are understandable, well intended, double checked and acceptable to fan boys and first timers alike. The script zips along with great pace and heart courtesy of Phil Lorde ( one of the brains behind the Lego movie) among others, and I would hazard a guess that they are all big Spider-Man fans. There is an affection at the heart of the film that is tangible and sincere. Care for these characters, every and each unique version, is taken and time given for them to explain their story and why being Spider-Man/Spider-Gwen/Spider-Ham matters and perhaps more importantly what it means to them. This is all topped off with some of the most breath taking animation, zipping and zinging between comic book styles and even harking back to those early pop art stylings in some of the backgrounds throughout the film providing the aesthetic of those early comics I was handed as a child. There has been a lot of thought put into this film, how it looks, what its message is and who these characters are. Even the standard, brief Stan Lee cameo appearance has a special poignancy given his recent passing. This is a comic come alive on the big screen in a manner that even the oldest comic book reader could appreciate. With a soundtrack to rival that of Kendrick Lamar’s Black Panther inspired album earlier in the year, Into the Spider-Verse completes the package to be arguably the best comic book film of the year and perhaps one of the best Spider-Man adaptations to have ever graced our screens. This is not the old ‘with great power’ era. This is something new with a bigger, broader lesson at its heart. We all want to believe we too can be heroes. Into the Spider-Verse lets us know that pipe dream is well within our reach all we have to do is take a leap of faith. Spider-Man: Into the Spider-Verse is in cinemas now. 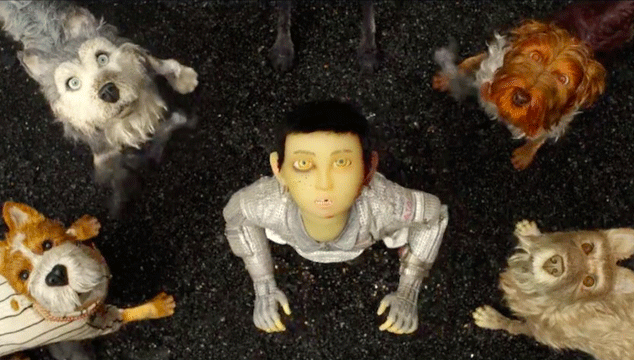 Set in a Japanese dystopia this stop motion animation sees Wes Anderson reassemble his loyal pack of followers with voice talents of Edward Norton, Scarlett Johansonn, Bill Murray, Jeff Goldblum and many more to bring us Isle of Dogs. When, by executive decree, all the dogs of Megasaki City are exiled to a vast garbage-dump called Trash Island, 12-year-old Atari sets off alone and flies across the river in search of his beloved bodyguard-dog, Spots. There, with the assistance of a pack of newly-found mongrel friends, headed by the curmudgeonly and wary Chief (Bryan Cranston) he begins an epic journey that will decide the fate and future of the entire city and its structures. I often wonder what goes on in the mind of Wes Anderson, his ability to build worlds be it animated or otherwise is one of the best in film. I want to visit the places he creates, stay at the Grand Budapest Hotel, visit the Moonrise Kingdom and wander the streets on which the Tenenbaums live. The Isle of Dogs is no different albeit a little more bleak than the others. Even amidst the trash, the fleas, the dirt though there is joy, laughter, kindness and hope to be found. The abandoned pets and strays of Trash Island are not the prettiest, not the best looking pedigree but they are wonderfully loveable, despite their quirks and tragic illness. Bryan Cranston as Chief is a wonderful grump, untrusting of humans and prone to bite; he is initially wary of Atari but gradually and unexpectedly becomes increasingly loyal to his new friend. This rag tag bunch all have their moments of humour with Jeff Goldblum's gossip loving Duke a particularly favourite of mine, although special mention to Tilda Swinton's Oracle who sees visions of the future/watches TV and repeats what she sees giving me some true moments of pure laughter. While certain sections feel a little baggy and possibly unnecessary, Isle of Dogs maintains a good pace and likeable story throughout. 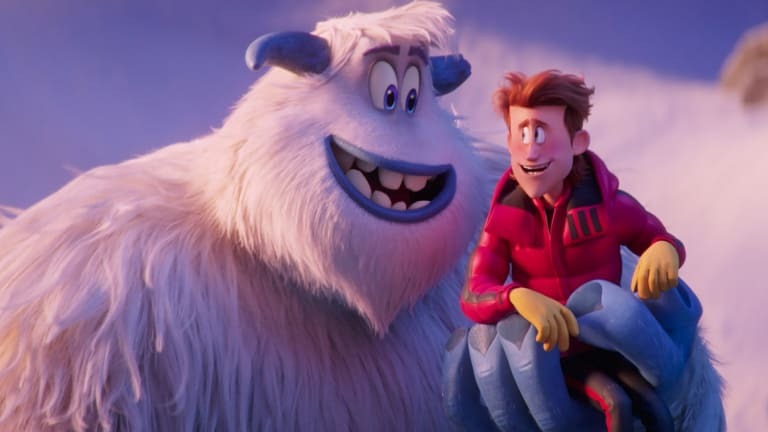 The animation is at times breath taking and in a world of digital rendering, credit for the painstaking task of stop motion in this modern world must be given all the praise available to it. There may be possibly too many characters at times for even Anderson to juggle but it is an admirable feat nonetheless that such a coherent story arises from the rubble of its surroundings. At its core Isle of Dogs asks us to question where our kindness has gone and ponder those we cast aside all too readily. In many ways Anderson is asking us to consider what indeed makes us human if not our capacity for kindness. As someone who returns to Anderson's films regularly I already know that when I revisit the Isle of Dogs, I will see more, I will hear more and while I will inevitably be charmed again by these furballs the bigger takeaway will be the compulsion to look for the cast offs that we so quickly discard. Isle of Dogs is in cinemas now. Having missed the opportunity to see The Red Turtle on its release earlier this year I was thrilled to see it selected for screening at the recent Cinemagic festival in Belfast. Added to this was the fact that it was to be introduced by critic Mark Kermode whose review of the film on release had made me long to see a film that otherwise may have easily passed me by. 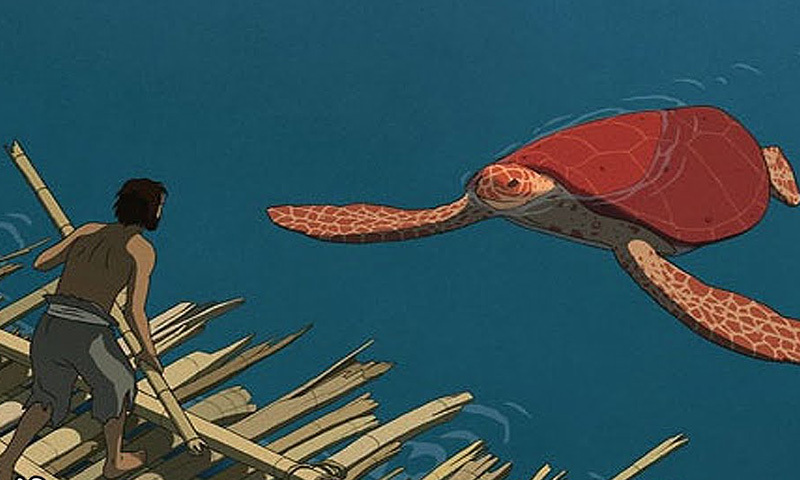 The Red Turtle is a Studio Ghibil and Wild Bunch co-production and tells the tale of a ship wrecked man who encounters the titular Red Turtle as he attempts to leave the uninhabited island he has found himself on. The turtle refuse to let him leave, destroying his raft on several occasions and when the turtle comes ashore he, in a fit of rage, overturns the animal only to be filled with regret. What follows is a story which is full of wonder, fantasy and universal appeal that had a deeply profound and lasting effect on me. The animation is truly beautiful at points, the many shades of beautiful water and sandscapes not to mention the night time sequences that have a beautiful monochrome aesthetic giving a wonderful realness to the feel of the film. It also must be acknowledged that this is, for the most part a silent film. A film in which the only real sounds are the reactions, yells of frustration or cries of joy on our shipwrecked humans part. The only other sounds that exist within the film come from nature and the island's surroundings, the wind in the trees, the crashing waves, the falling rain all things that every viewer can appreciate and understand. The universal appeal does not only lie within the films soundscape but also its message. Within its components of fantasy lives the acknowledgement and charting of the major milestones of human existence. Birth, death, companionship, joy, loss all have their moments and are all dealt with in such a loving and tender manner that should be impossible to watch The Red Turtle and not see something of your own story within its frames. A film that highlights mans relationship with nature and its unbridled power. A film that reminded me of the call from Eden for humankind to act as caretakers and curators of this world, and also contemplated with great depth the connectivity and the oneness that lies within. The Red Turtle is simply beautiful, a film with a universally profound story that will soothe many a weary soul in these chaotic times. After his mothers sudden death, Courgette (Will Forte) is placed in a foster home filled with orphans his age. Befriended by a police officer, Raymond (Nick Offerman) and getting used to his new peers and surroundings Courgette eventually learns to trust and love, as he searches for a new family of his own. Having heard rave reviews of this beautiful animation, I was delighted to find it had become available on Amazon Prime. A lovely story wonderfully told I was enchanted from the first minute as we see Courgette home with his alcoholic mother. Told in a simple enough way but dealing with at times very complex issue My Life As A Courgette is for children and adults alike. No one should come away from the relatively short film unhappy or unserved by its message. Heartbreaking at times, in particular when Simon (one of the boys at the home) tells Courgette everyones story, this film does not shy away from big issues. Instead it talks them through with a childlike logic that has a real authenticity to it. While an adult cast perform voice duties they speak as children would, a rarity in film at times where so often on screen children can find themselves filled with unrealistic dialogue and notions. There is a sadness that runs throughout My Life As A Courgette that is shown in the slumped nature of the children and the rings of weariness around their eyes. These kids have had experiences that they should not have had to endure. There is however hope. Hope found in friendship and each other that, as the film progresses, renders itself in subtle smiles and deep laughter. I was utterly charmed by My Life As A Courgette and would not hesitate in recommending it. Young or old can watch this and find a message that rings throughout. No matter how bleak circumstances may seem, there is hope, difficulties can be overcome and love exists not just for the few but for everyone. My Life As A Courgette is available now on Amazon Prime / DVD and Blu ray.